Chicken pot pie doesn’t really seem like a food you would make during the summer, but Alex was coming home for a few days and I am always trying to fatten him up. So this seemed like the perfect dinner to serve my poor, skinny college boy. I started making this recipe, or a form of this recipe many, many years ago. When I started making it, the recipe called for all canned stuff. 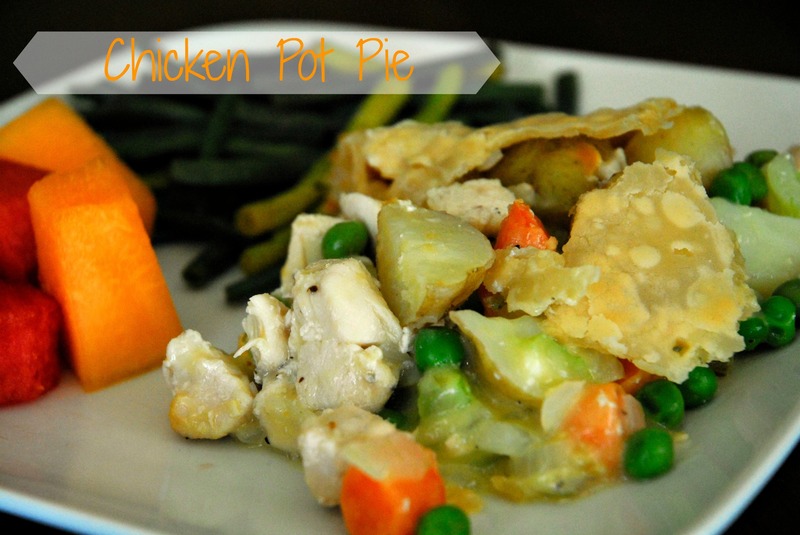 Canned chicken, cream of potato soup, frozen veggies and store-bought pot pie crust. I switched a few of the things around to make it a bit heartier and maybe a bit healthier. 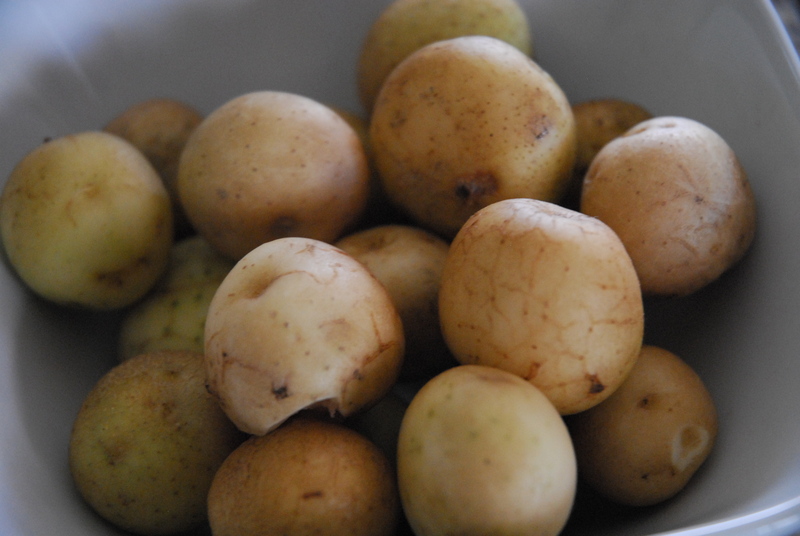 The other day when I made it, we had some home grown potatoes, so that made it extra yummy! 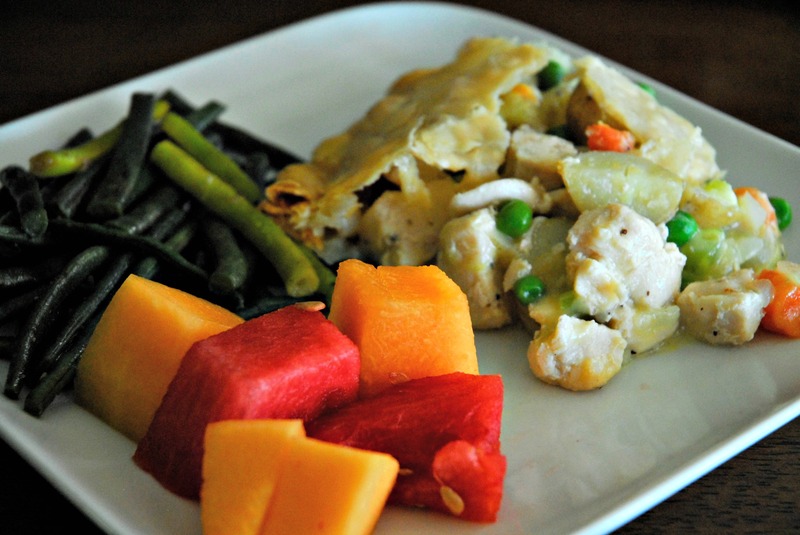 While this recipe has a lot of steps, it really comes together quite quickly and you can clean everything up and pull together the rest of the meal while the pot pie is baking. Preheat oven to 350* Unroll the bottom piecrust and place into an ungreased pie plate, forming to the edge of the pie plate as needed. 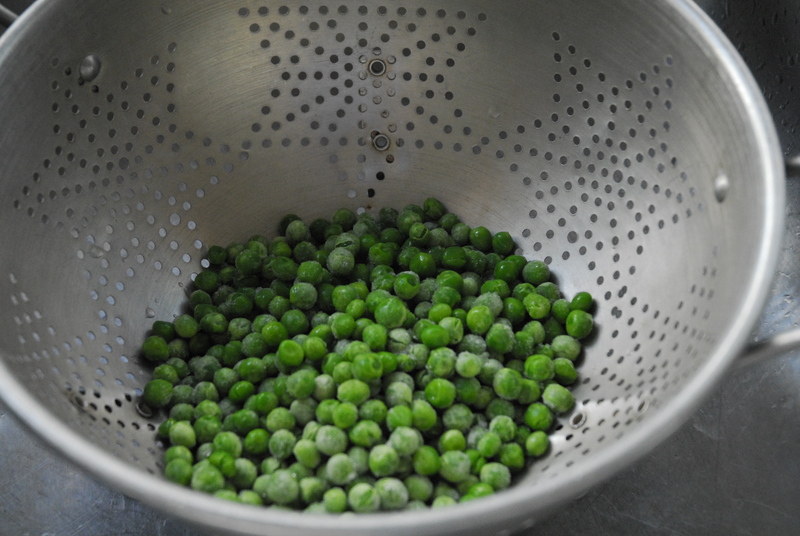 Pour frozen peas into strainer. and then add the carrots and cook for about 10 minutes, but not quite fully cooked, because they will finish cooking in the oven. Pour potatoes and carrots into the strainer with the frozen peas and drain. Meanwhile, heat the oil in a saucepan. Once heated, add the chicken, season with pepper, and cook until no longer pink in the middle. I sometimes have leftover chicken to use, or I just cook some up for the recipe. 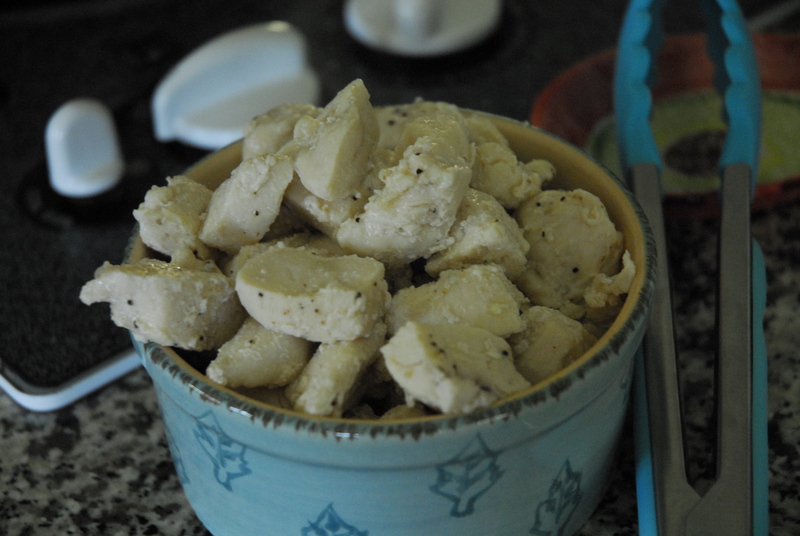 I love using the frozen boneless, skinless chicken breast pieces. They defrost and cook up in no time and I always stock up when they are on sale. 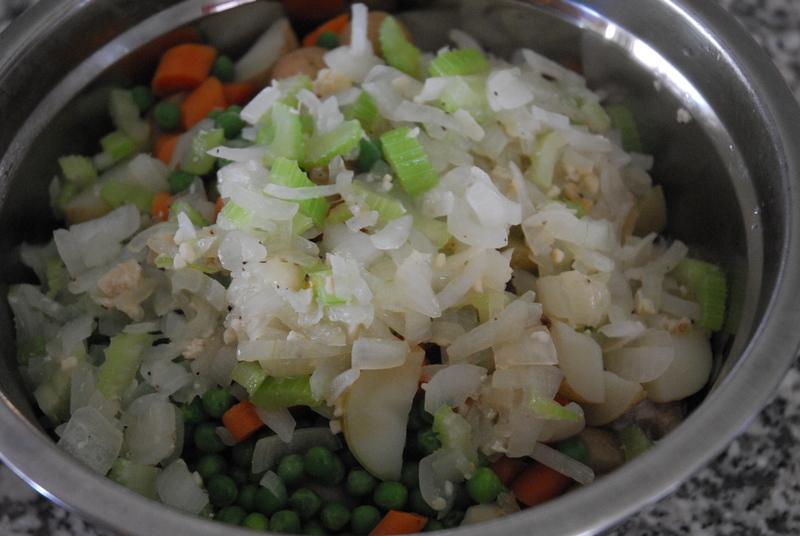 and cook minced garlic, celery and onion until soft and fragrant. 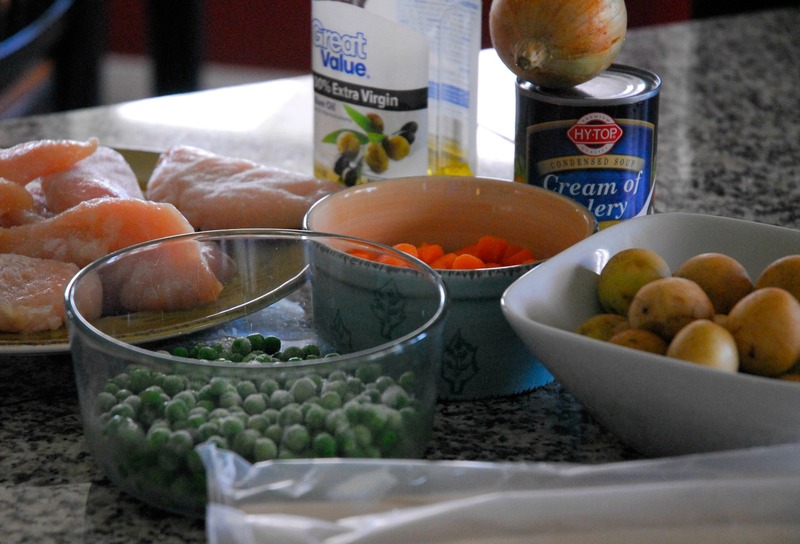 In a large bowl, mix cooked chicken, potatoes, carrots, peas, celery and onion. and cover with second pie crust, crimping edges. Cut air vents. Place in oven (if pie is really full, cook on cookie sheet so it doesn’t bubble over into your oven), and cook at 350* for 45 minutes, or until crust is golden brown. Let cool for about 5 minutes before cutting and serving. 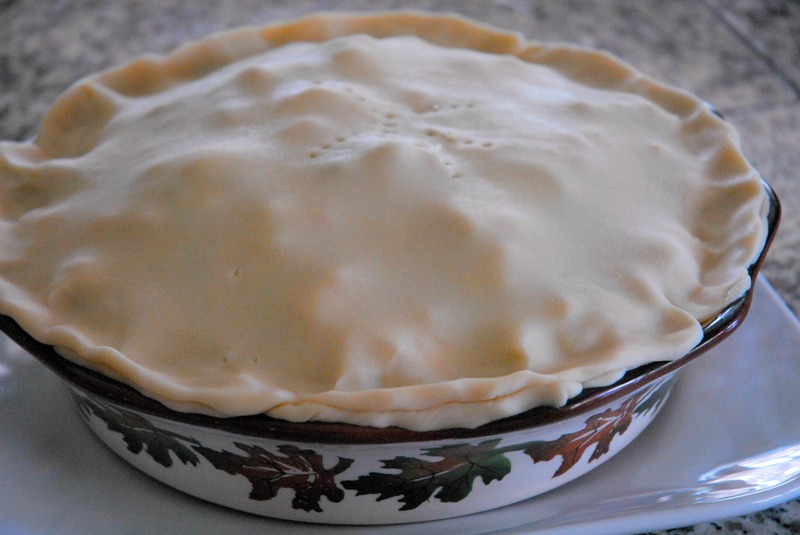 Unroll the bottom piecrust and place into an ungreased pie plate, forming to the edge of the pie plate as needed. Pour frozen peas into strainer. 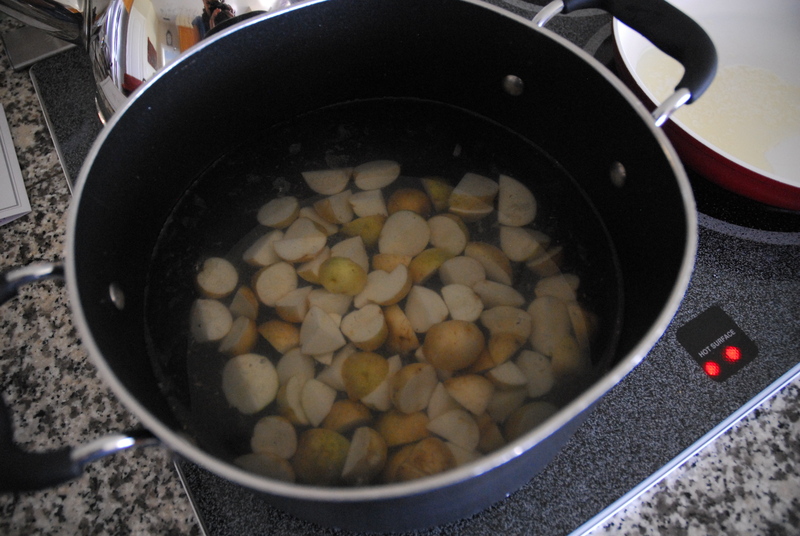 In a large pot of boiling water, boil potatoes until just beginning to soften, and then add the carrots and cook for about 10 minutes, but not quite fully cooked yet, because they will finish cooking in the oven. 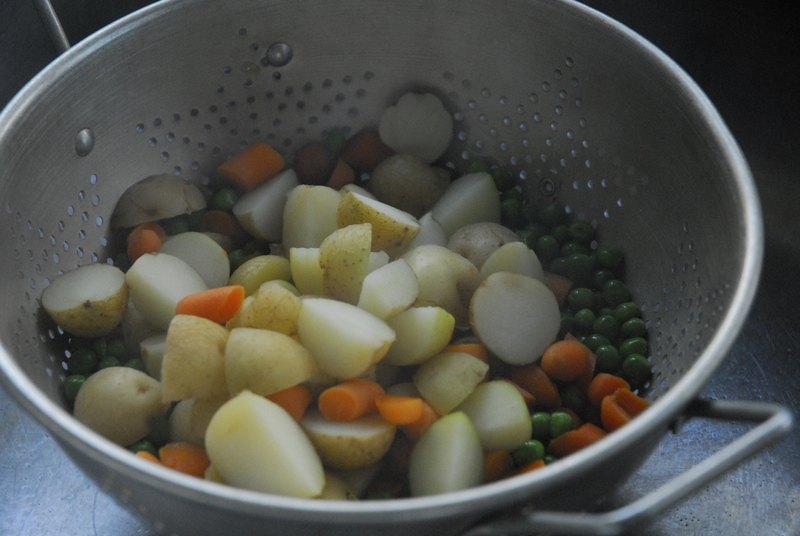 Pour potatoes and carrots into the strainer with the frozen peas and drain. Meanwhile, heat the oil in a saucepan. 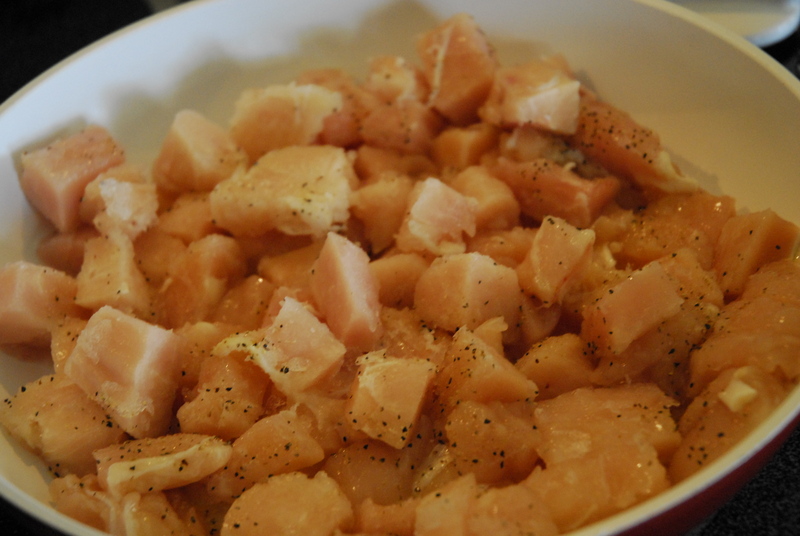 Once heated, add the chicken, season with pepper, and cook until no longer pink in the middle. 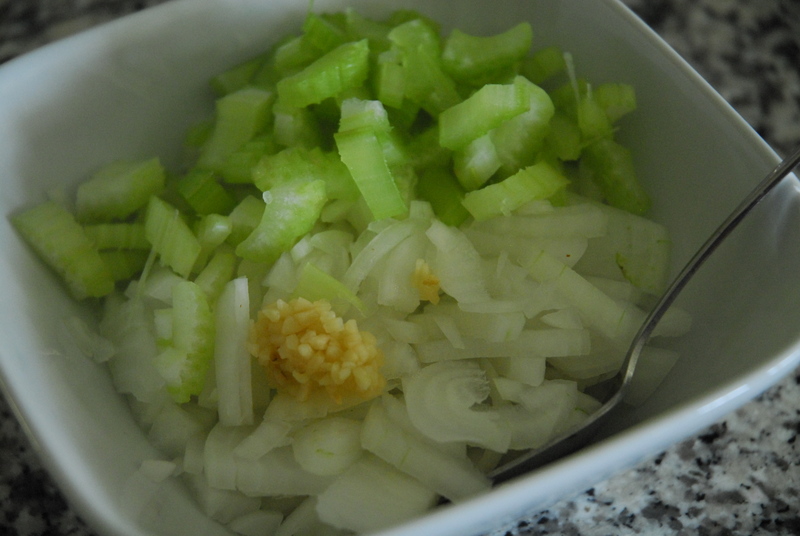 Remove chicken from pan and cook minced garlic, celery and onion until soft and fragrant. 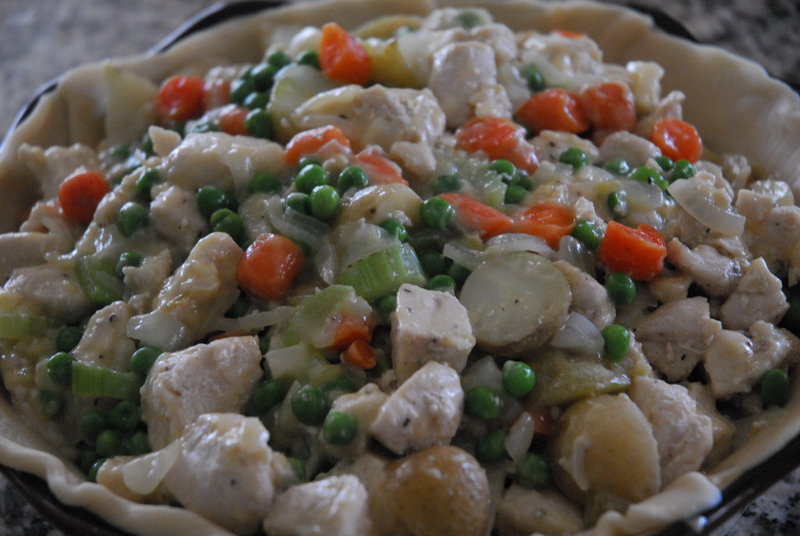 In a large bowl, mix cooked chicken, potatoes, carrots, peas, celery and onion. Then add cream of chicken soup and mix well. 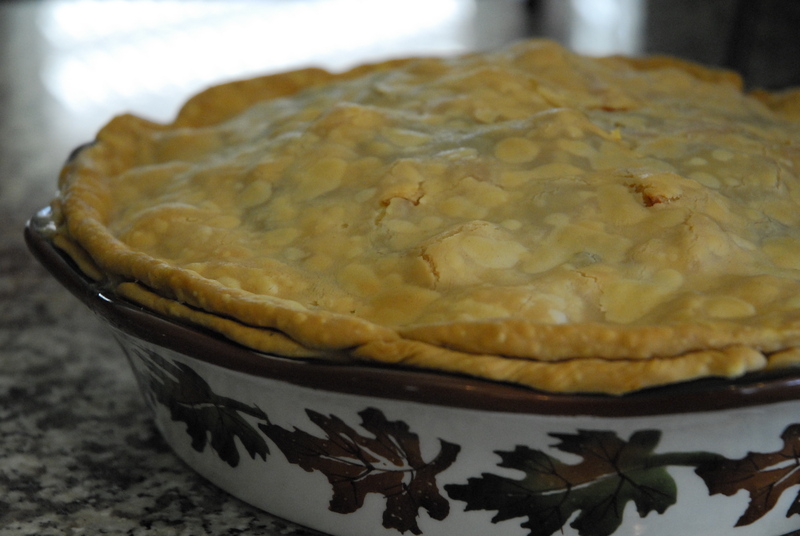 Pour everything into pie shell, and cover with second pie crust, crimping edges. Cut air vents.